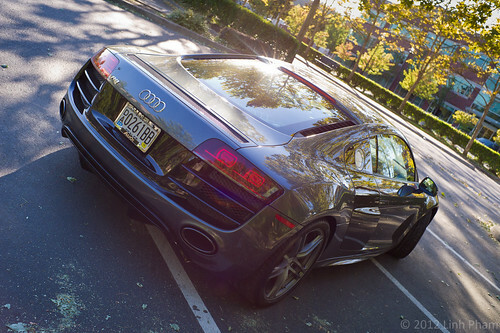 This is the second post in a series documenting my #WantAnR8 weekend. In the previous post, I covered the moment that I learned that I had won a weekend with an R8. Fast forward to Saturday morning. Instead of leaving my S5 at the parking lot for the majority of the day, I opted to be dropped off at PDX C&C at about 8:00. Went into the Starbucks to grab some breakfast and to chat the guys that were already there. Several more regulars arrived and discussion started to turn towards the “surprise” I had planned. A bit later, the film crew came over and gave me a quick run-down of that morning’s plans. The jig was up! They were already setting up outside in the parking lot and I had to spill the beans… there was cheering and congrats flying about. The film crew called me outside, letting me know that they were ready to film the interview and start staging the delivery of the R8. Unfortunately, things didn’t quite go according to plan when the R8 showed up a bit early. Once that was taken care of and a wireless, hidden mic was rigged under my hoodie, I started the filmed interview process. Before going any further, I do have to say that I am generally really shy even without a camera pointed in my general direction. I had been prepping myself the night before, but I was still a bit nervous and probably showed on a couple of takes. Once the filmed interview was over, there was a little bit of time between that and delivery of the R8 along with the ceremonial handing over of the keys. During that time, I worked on corralling some of my friends to huddle around one of the cars. Initially, that car was an older red Porsche 911. This being an Audi event, it made a lot more sense to huddle around and chit-chat about an Audi. So, the red Porsche was moved and a beautiful, modded 2009 Meteor Gray S5 was parked in its place. Within minutes, the R8 was driven down the main aisle and parked next to the Meteor Gray S5. Logan, who regularly attends PDX C&C and does a fantastic job of chronicling the cars on video, captured part of that moment in the following video. The important part starts at about 6:39. I was then given the tour of the R8 V10, which was dressed in Daytona Gray, had the R Tronic single-clutch automated manual gearbox and the Titanium package (carbon fibre blade and engine bay adornments, plus Piano Black interior inlays). The seats were standard black leather and also had the black Alcantara headliner. I was handed the keys and sat in the R8. With a little encouragement from the group, I started to rev the engine a bit. Right after that, Molly, the owner of the Meteor Gray S5 joined in the fun. The exhaust-off between her S5 with an AWE exhaust and downpipes and the siren song of the V10 is just pure aural ecstasy. The Audi specialist continued the walk-through of the R8, its specifications and features. Being an Audi evangelist and having spent hundreds of hours learning about the car over the past years, that portion of the delivery was a bit… dull. The film crew was also capturing not only my reaction and responses, but also everyone else’s reaction and responses. Once that bit was done with, the film crew wanted to film a quick drive of me in the R8 and two GoPro cameras mounted to the car (one inside and one on the driver side). Since it would have been rather droll to just have me drive it along, so I asked Molly to join me. My destination was to head down to Audi Wilsonville and would have preferred to blast down I-5. Unfortunately, I-5 came to a crawl (due to two big college American football games). So I took the next exit and took the back roads. While the back roads would introduce a fair amount of red lights, it also introduced two interesting moments. First, there was a person driving a Mercedes-Benz sedan that blew through a red light right by Bridgeport Village shopping center. The second one was a weaving Ford Explorer that almost ran off the road. Beyond that, the cameras captured a nice pun that I delivered (if you know me, that shouldn’t be a surprise) and a good amount of Richard Hammond-esque giggling. On the way back to PDX C&C, I took I-5 northbound, which was relatively free and clear. I decided to have a bit of fun and kept the gearbox and either 4th or 5th gear. There were two ladies in a BMW 3 Series convertible that cheered, jeered and one waved her arms as I passed them by in 4th gear. Yep, ladies dig the R8 (some go further, but I’ll leave that to your imagination). When we got back, the film crew grabbed a first driving impressions (technically, not my first) and some thoughts from Molly. After that, the film crew wanted to do some close-up interior shots while driving around the block. The next bit of filming took us out to Wanker’s Corner, which is now a round-about, into West Linn, into Tualatin and down towards Sherwood. This part of the filming included side-by-side driving, either tailgating the film crew’s van, driving right along side or blasting by. The first two were a bit nerve wracking as there was still traffic going down the roads. Also, I was quite nervous about driving so close in case the van had to stop suddenly. On that note, a little PSA: please do not tailgate and leave at least one car length between you and the car in front of you. Once the film crew was done and sent me off to enjoy the R8, I drove up to Hillsboro to meet a friend, do a bit of driving, had a late lunch and took some pictures of the R8. I then dropped him off and decided to head westward on Hwy 30 towards Astoria. I took the long and winding roads from Hillsboro out to Hwy 30. Headed out towards Astoria, but as it was getting pretty dark as I got nearer, I whipped around and went up to Longview via the Lewis and Clark Bridge. I came back towards Portland on I-5 and took I-405 then Hwy 26. Right as I approached the tunnel, I dropped down from 6th to 4th gear, slowed down a bit, then accelerated as I entered the tunnel. If you have seen the first Top Gear episode of Series 10, in which the gang drove their lightened supercars through a tunnel on their way to find the best driving road in the world. Well, it wasn’t that epic, but still made my whole body fizzy and I had to do it again and again; but, that will have to wait for another episode of #WantAnR8 Experience. For this post, I would like to thank Joel Feder and Allen Stephens for the photos from the Big Day. You can view the photos taken by Joel below or check out all of Allen Stephens’s photos on Flickr. 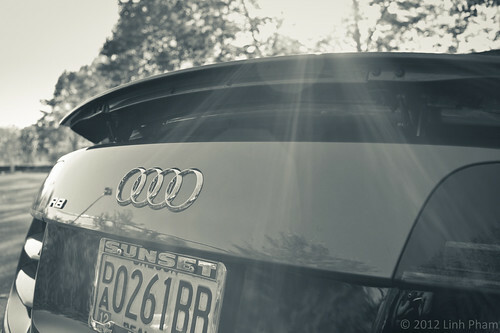 You can also view my photos from the afternoon photo shoot on Flickr in my “#WantAnR8 Experience: Day 1” set. Stay tuned for the next post in the series, which will cover the reminding time with the R8. Hrm… women like R8s, eh? I didn’t realize you had read E.L. James’ Fifty Shades of Grey trilogy! Having a camera that close to me would make me extremely nervous and may have an anxiety attack. I haven’t read the Fifty Shades trilogy yet, but got the gist of things based on what I’ve heard of it. I was also mentioning another #WantAnR8 moment that I shall not mention here (as I have already mentioned enough on Twitter :D). Love the photos and love the blog! So very jelly, if only Audi did something like that here in Australia. However, your win was very well deserved; I cannot think of a more appropriate winner :) What a wonderful prize! It would be awesome if other Audi corporate presences around the world would do something similar. If an R8 isn’t feasible, an RS 5, TT RS, RS 3, S6 or S7 would still draw attention to the brand and engage even more enthusiasts.